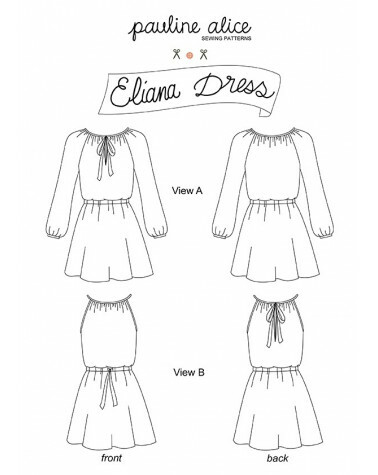 The Eliana dress is a semi-fitted dress with gathered neckline and waist. The flowy skirt has inseam pockets and hits just above the knee. View A has long raglan sleeves gathered at the wrist, a front opening and an elastic waistband. View B is sleeveless, has a back opening and ties at the waist with a grosgrain ribbon. - View A: 2 m. (2 yards)of 2 cm wide bias binding (3/4" wide), 1 m. (1 yard) of 2 cm wide elastic (3/4" wide). - View B: 3 m. (3 yards) of 2 cm wide bias binding (3/4" wide), 2 m. of 2 cm wide grosgrain ribbon (3/4" wide).